It have put in a stock 2.0 engine with a single solex 34 carburetor, slightly more aggressive camshafts from Lancia, lighter fly wheel, 4-1 exhaust, larger radiator, full roll cage built to original Abarth group 4 specs, custom made front suspension, roll bar and mostly stock (some new) items like original Fiat vacuum pump, Zimmerman disks (standard size), standard clutch, Smoor wheels (13x 7,5 inch front on 195x 60 tires and 13x8 inch rear on 205x60 tires). During two seasons of classic car rally and track events I have switched to stiff adjustable Bilstein shocks and H&H springs in front and matching Bilstein shocks with original springs from the front the in rear, double radiator fan, two double Solex 34 carburetors, bucket seats from an original 131 rally which crashed in Norway. - rebuild the rest of the exhaust to original Corsa specs DONE AS PER GUY'S SUGGESTIONS - WORKS REALLY FINE ! My VDO gauges indicate the coolant temperature almost never goes below 100-110 deg Celsius, and oil temperature (measured via a sensor build into the oil pan plug) keeps a constant minimum of 90 deg. C. This if far too high and I need to cool it in a major way. Any ideas ? Or maybe my gauges are off ??? It was never dyno-tested but compared to my competitors and based on just my sense of how it works - it needs better mid RPM response, and simply more power !!! My current assessment is ca 130 hp. Goal is 160/170 hp. Before resorting to more mechanical changes (a new engine is being built) I want to optimize the camshaft adjustment on the current engine, give it better exhaust, and provide better fuel supply. Experience gained with this will help me to tune the new engine. Over the two years I have collected a volume of spare new and rebuilt parts I would be willing to trade. The car is registered as a Vintage Car with special yellow plates and I plan to get the car to original abarth specs (keeping it as close to 100 originality as possible). I am still missing a lot original parts and equipment like Colotti gearbox, ZF LSD, independently suspended rear differential, original 15 inch Cromodora wheels, larger brake disks and disk brakes in the rear, so there is along way to go. Any comments , feedback ??? During the season the car drove very well, especially with adjustable camshaft drive wheels, bigger diameter of the exhaust and muffler Guy recommended (thank you Guy!) though had to install Intercom to hear my co driver on a stage. Also lowered rear springs put slick tires, put the roof spoiler. The roof spoiler was hard to fit. After some failed attempts I bought a beaten up Mirafiori, cut the roof off and gave it to my mechanic. After few months he managed to adjust the spoiler perfectly. Also added Haldas (Speedpilot V and Twinmaster). Nice pieces and work fine, though it took a long time to fine tune calibration. Continued problem with heat despite two fans and a manual override switch. Decided to go for Castrol Edge Sport 0-W60 to protect the engine. Was not sure and did a lot of research and ..to the surprise of some skeptics it works real well - no leaks !!! I will add an oil cooler next year and uprate the oil pump to deal with larger oil volume and system capacity. As you may notice changed my "lorry size" Hellas to a nice set of original Carellos. Mounting is not based on historic examples , but decided not to cut into the body . Also the very strong steel tube on which the lights are mounted serves as additional protection of the engine should we "visit the landscape" (= run into a ditch). This is only to prove my beloved Abarth is a never ending story . - installation of a 16v head ( maybe - if I can find a good one in reasonable price range) Gave up - the GC engine works so fine, and delivers sop much power and torque that I do not need any more ! I started the "new engine "project project in October 2008.The engine was to be done by a friend who specializes in Alfas and has really made probably some of the most powerful and reliable sports Alfa engines in Poland, The guy is really a fantastic expert on Alfas but Alfa is an Alfa and Fiat DOHC is a Fiat DOHC. I started developing doubts in February 2009n when I was asked some technical questions (like "What pistons, cranks, rings, camshafts do you want to use" or "what main bearings will we use". I did not quit expect to be asked these questions , but rather be told which will be the best for the engine we are building. This made me think and discuss it with my co-pilot One such discussion took place in the presence of my wife . She listened for a while and said: "hy don't you just just take away the risk of experimentation , and go for a solution which is risk free. This certainly caught my attention. My wife continued: You are buying parts for the new engine from Guy Croft , these parts are experimentally mixed and matched with other parts by the Alfa expert . There is no guarantee such a "mix and match" approach will work. Engine is a very complex entity with lost or interdependencies. One mismatched component can cause the whole system to fail or at least to have a build in weakness. Lack of power , failure or incoherent performance will result. We are too poor to take such risk. Call Guy tomorrow and as him of he will build this engine for you. It may cost more up front , but it will be less costly over time. And most of all you will have a reliable, high power machine the first time around and you wiil enjoy it next season for seasons to come. To make her point she said she will fund this project (!!!). On April 2009 my co-pilot and I jumped in the car, put all of our donor parts including the head and block plus the parts I have already purchased from Guy in the boot and drove to Lincoln, where I met Guy and his great wife. Spend all day with Guy learning first hand some of Guys ways. We discussed the rally and race track events I take part in, my expectations, etc. so that Guy may decide what engine would be the most suited. Ultimately Guy declared that this should be a Stage II Rally engine. Leaving Lincoln I was utterly impressed I exceedingly happy with my decision to ask GC to build the new engine for me. Soon after the project really started. I was updated on progress and with great anxiety studied all Guys reports on progress and looked at the pictures documenting each stage of progress. Ultimately the engine was built and all that was to finalize the project was to dyno the new engine. Due to heavy commitments the dyno testing was delayed for some months. As it did not matter to me with the racing season still months away. Ultimately the tests started but had to be stopped , due to a mechanical failure of the dyno test unit. Later it proved that the dyno (a newly acquired Swiss unit) wil be tested on my engine. Well the engine survived , but the advanced and computerised dyno unit proved to have software problem which prevented rpm from being read over 6500. Finally Rotronix fixed the problem and Guy called with initial results. As you can imagine I was thrilled to hear the results, and amazed with disbelief seeing the dyno graph and tables.In fact I am a bit intimidated to think of actually having to must this "monster" engine in my car. That will be a sheer thrill. So the task now is to install it all of this into my car. To make the thrill more complete ,thanks to Guy's help I was also able to acquire full rear Abarth Grp. 4 suspension. All this this is definitely is a turning point in this project. Aside of new GC Engine and full Abarth front and rear suspension installation the car will be striped from Stradale upholstery, fitted with Abarth seats, safe fuel tank, mechanical extinguisher system, hydraulic hand brake, original Grp.4. doors, Grp. 4 rear view mirrors, large inner headlights , full steel /aluminum sump guard plate, ATE calipers front and rear, CD 68 15" wheels (7" front and 8" rear), removal of standard blinkers and replace them with original Julietta round white repeaters on the front , original Grp. 4.steering wheel, Grp. 4 gearbox, etc. The target is to achieve in 2011 a full, complete replica of Grp. 4 ( non tarmac , due to "small" non tarmac arches). From one of many 131 Abarth Replica projects suddenly this turned into one of very few of this kind. When I started the project , I never expected I will have a chance of driving a 131 Abarth (Replica) with a GC 185 BHP engine and full Abarth suspension, and full Grp. 4 specs in accordance with FIA homologation. Well, dreams do come true (with a little help of our friends and funding from your wife!). Despite the title "never ending story" the chance are the project will be completed in 2011. The plan is to get it to full homologation specs with the notable exception of 16v head and Cima gearbox. PS: See page 38 of this thread for most complete and current ( with pictures) . Last edited by miro-1980 on July 15th, 2017, 11:44 pm, edited 23 times in total. I think the car is brilliant, Miroslaw, well done! * which is by way of saying the non Q&A bits of the site have to pretty -well run themselves! Please see the update to my original post . Lovely car Miro! WE have a road car , and a rally car 131 Abarth (s) here , so if you would like any help or pictures I' would be delighted to help . I am preparing for installation of a full abarth rear suspension which needs to be manufactued for this purpose (well advanced). The problem will be both in stallation itself as well as proper alignment of the rear. Any pictures, data, tables data abarth suspension would be precious. PS Also, I underxtand there were differences between abarth and standard front suspension . I have zero on this. Any pictures I have I will send . The Abarth Front is MacPherson strut , with a Tension strut ,and an ANti roll bar over the Tension strut . The lower suspension arms are the same as non abarth , apart from having a bracket welded on to attach the drop links from the ARB . 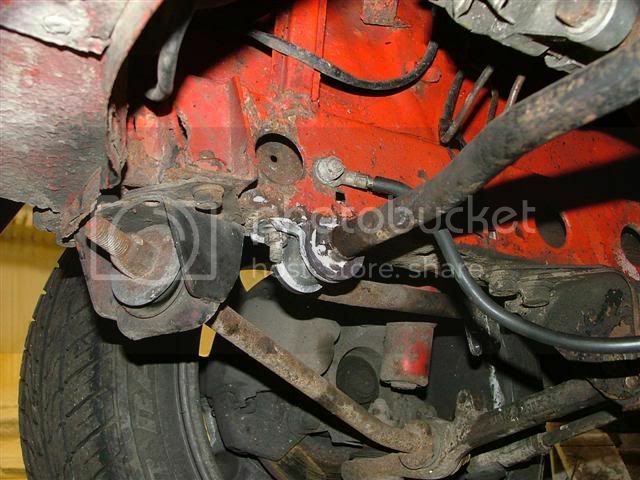 For rear assembly , I have heard of people using E30 BMW , it is easier got , choice of LSD's , and parts ae easier found . Plus it is still very similar to the Abarth . could you please explain (a diagram would be ideal) what the "tension strut" is? The normal 131 has an integral anti roll bar/track control arm, does the abarth still use this? Member Leon from South Africa has numerous components for sale that would worth exploring. A far nicer car than all those pesky (and vastly over priced) Escorts! where another member Walezy already constructed a replica. Testament wrote: could you please explain (a diagram would be ideal) what the "tension strut" is? No , the Tension strut replaces this . It attaches to the lower arm in the same place as the ARB , and runs forward same as the ARB , but is attached directly to the front cossmember . Some people call them brake reaction arms . I will get a picture hopefully soon . (having problems with my image hosting site) . The ARB is comletely separate as a result . found a picture! This is a 131 AR Stradale I rebuilt for a friend . The 131 Abarth uses a McPherson type. However, the E30 is widely avalable and a good selection of gear ratios + LSD is available. It also works quite good. And it comes completely with a frame...typical trackwidth is ~1400mm . 3-point adjustment to the car-body visible in picture. Well ok , not very similar , but it is still an Independant Rear Suspension set up , with the Diff and halfshafts arranged in much the same fashion as the 131 AR . Are there any other cars with a more Fiat like rear end? Any of the current crop of Japanese sporting hatches or saloons? It is easier just to use BMW diff and make the rest from scratch. No need to use BMW suspension, you need just the diff.